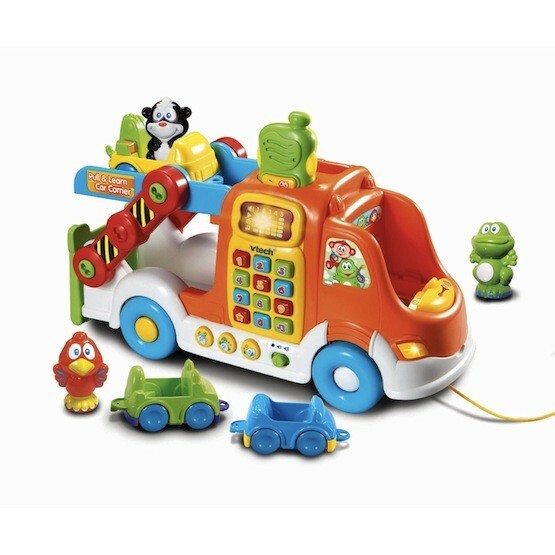 The Vtech Pull and Learn Car Carrier is an electronic playset for toddlers 12 months and up. The car carrier is loaded with three vehicles and three animal characters for busy toddlers! The magical sensor on the back of the car carrier identifies the vehicles when they are rolled over the sensor. Insert the animals into the hot spot to hear the related animal name and sound identified. Load up and let’s go! This toy also includes buttons that introduce numbers, colors, and animals, and a removable CB radio for pretend play.